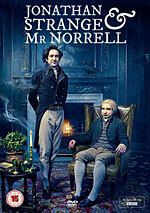 Determined to prove himself England's greatest magician, Mr Norrell makes a dangerous pact with a mysterious being. Wow, there's been no activity in this show-only thread. Huh. I didn't ever read past the very first part with Norrell, so this one episode already progressed far beyond what I'd read. I don't really want to be spoiled, so I won't read the other thread. I enjoyed this and am really appreciating Eddie Marsen's performance as Norrell. I'm not quite as sure about the episode in general -- it seems to me to be disjointed, almost like a series of connected vignettes, and a little too self-aware. But that's quite like the book, as much of it as I read, anyway, so maybe that's appropriate but just not quite to my taste. As for the story -- I'm very suspicious of the relationship between Vinculus and (I presume) the Raven King and Strange. Everything seems contrived toward engineering Strange to be the other magician; he wouldn't have been so without Vinculus's machinations. Which surely must actually be the Raven King's. But has Norrell been similarly manipulated? He's said by Vinculus to "lie more than anyone" (said to Childermass), and clearly Childermass is being led along, too. But is Norrell? It seems possible that Norrell might even be not the naif that he appears. Be patient -- once it's aired on BBC America I bet there will be more activity! Yeah, kind of waiting for this to show up here in the States. When I saw this thread I was like "oh crap -- it's started already?" But no...another few weeks. Loved the book; the TV series will inevitably be very different because it's a very *bookish* book, but I have high hopes. Just watched this and it's in that glorious English authenticity - huge smoky rooms, tons of books, and slow to start. I agree, Norrell seems almost afraid of whatever power he has, and I haven't quite figured out the street magician apart from being a prophet. I've got the book in my Kindle app but haven't read it yet so I'll be over here in the show-only thread. They have a free preview of the first episode on iTunes and we watched it and I'm hooked. Norrell definitely knows more than he's saying even if he doesn't know enough. We were delighted to see Marc Warren (whom we know as Rochefort from S2 of the Musketeers) turning up as The Gentleman. I didn't even have to see him to know that he was nothing but trouble: the silky evil voice was enough. "We were delighted to see Marc Warren (whom we know as Rochefort from S2 of the Musketeers) turning up as The Gentleman." He'll always be Elton Pope from the Doctor Who episode Love & Monsters, to me. I wished I could have found a clip of Elton jamming to ELO, but no luck. I'm not entirely happy with his performance here, though. He's good, but it doesn't quite work for me. I had not made that connection, but sure enough, that's him. Thanks for pointing that out! Aha, I knew I recognized Vinculus from somewhere. He's also been on Game of Thrones. Awesome, something of a madman all-around, and well-played at that. We were delighted to see Marc Warren (whom we know as Rochefort from S2 of the Musketeers) turning up as The Gentleman. I'm not familiar with him, so at first glance I thought it was Bill Hader, looking oddly similar to his Greg the non-alien character on SNL. I rather liked Mr. Norrrrrrell's John the Baptist, mostly for his unique pronunciation of Norrell. Oh, and Enzo Cilenti looks much different in his IMDb headshot from his shaggy, unkempt character in the show, Childermass, who almost seemed to be Mr. Norrell's rakish familiar who pushed him to act more boldly against his calm and bookish nature.